The Scorpion is a hydro jetter suited to commercial use with drains ranging from approx 100mm - 300mm and where volumes of up to 41 litres per minute are required. Drawing on a 27hp or 31hp Vanguard Briggs & Stratton engine, the Scorpion comes in 3045 psi, 4060 psi or 5100 psi models and with a host of accessories. start petrol air cooled V-Twin BIG BLOCK engine. - Advanced Debris Management System features easy clean access prolonging engine life. - 5 inch cyclonic industrial Donaldson air filter. - Dual ball bearing supported crankshaft. 3045 - 5100 psi pump working pressure. 21 - 41 litres per minute water flow rate. 1450/1750 rpm pump running speed via directly coupled 2:1 reduction gearbox with oil indication sight glass. Stainless steel fuel suppy tank. * FEATURE PRESENT ONLY ON SCORPION MODELS 210 & 280. ** FEATURE PRESENT ONLY ON SCORPION MODELS 350. Tracking (Briggs & Stratton Model Only). 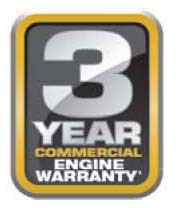 Upgrade to 31HP Briggs & Stratton Engine.